In Serre Napoleonienne tapestry we see an courtyard scene of the Chateau de Malmaison, the country home of Josephine and Napoleon Bonaparte. Here we see a lush garden and fountain with a large tree and climbing plants over tall columns. 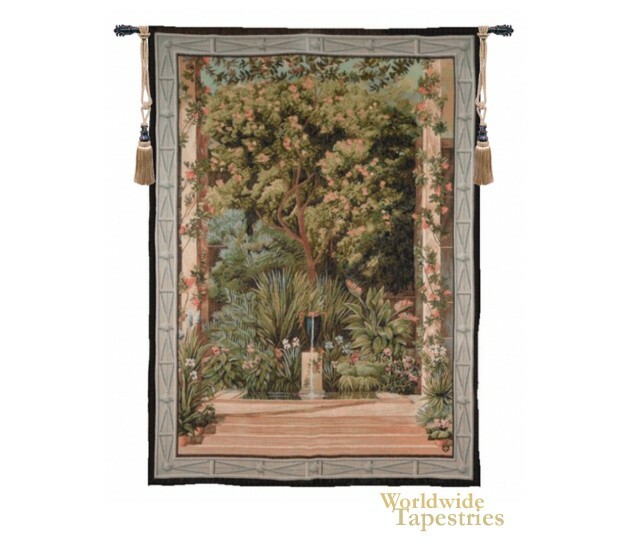 The Serre Napoleonienne tapestry is backed with a lining and a tunnel for easy hanging. Note: tapestry rods and tassels, where pictured, are not included in the price.